Work-related injuries such as a herniated disc can force you to spend a considerable amount of time away from your job. Acute traumatic injuries, repetitive sprain/strain injuries and other work-related injuries may entitle you to receive medical treatment coverage through the California Workers’ Compensation System. If that’s the case, Long Beach Spine and Rehabilitation Chiropractic Health Center can provide primary and secondary care and the necessary documentation needed to fulfill the requirements of the California workers’ compensation guidelines. Either directly or indirectly, just about any occupation can lead to some kind of injury. Lifting a heavy object without the necessary equipment or teammate assistance can cause both torn muscles and herniated discs that pinch the spinal nerve roots, while slips and falls can cause acute injuries to your vertebrae or other joints. If you drive for a living, vehicular accidents may also fall under the category of work injuries, causing you to leave your workplace with a case of whiplash, sciatica, seat belt injury or other damage. Read our Workers Comp flyer. Our team not only gives you the treatment you need to get back to work quickly, but we also make sure those procedures are documented and submitted correctly. We discuss your injury circumstances and symptoms with you while performing a detailed physical evaluation. We will then prescribe appropriate chiropractic adjustments, soft tissue therapy and physiotherapy, as well as a home exercise program to help facilitate your healing. The goal is to relieve pain, tingling, numbness and motor control problems while restoring strength and range of motion. We also recommend ergonomic or work habit adjustments to help prevent re-injury. 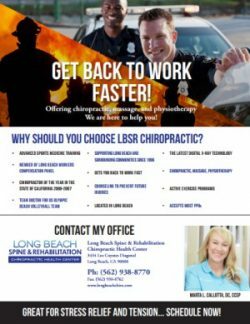 If you need a Long Beach chiropractor familiar with the California Workers’ Compensation System, contact us and we’ll help you get your body working again! Give us a call us at 562.938.8770 to schedule an appointment.